Ruto's Clean Bill Of Wealth. Ruto’s Clean Bill Of Wealth. 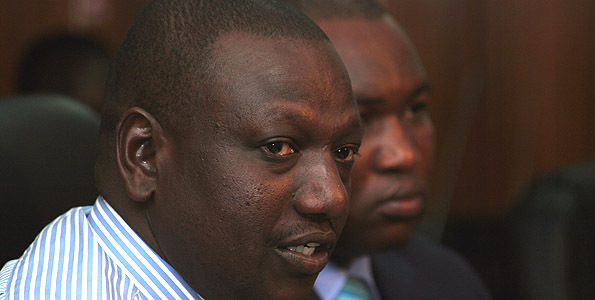 ELDORET North MP William Ruto yesterday said he has enough wealth to fully finance his 2012 presidential campaigns. Ruto said he has nothing to hide although people have questioned the source of his wealth and how he finances his campaigns. Ruto is conservatively estimated to be worth several billions of shillings. “I can account for every coin that I have. My wealth declaration forms are available for scrutiny. I have paid mortgage since 1996, sometimes two or three mortgages for whatever properties I own. The records are available from the financial institutions and banks. I have painstakingly bought shares in companies including some that I have built up from scratch through sheer had work. The records for these are also available,” said Ruto on his Facebook page. Ruto, the probable United Democratic Movement presidential candidate, said he can show how he legally acquired every property and business he owns today and dared anyone with contrary information to take him to court. Ruto wondered why questions were now being raised about his wealth yet in 2007 he helped to raise half of the fund for the ODM party and its presidential candidate Raila Odinga. “I sold chicken at railway crossing near my home as a child. I built my father a house using my university boom. I paid fees for my siblings. God has been kind to me and through hard work and determination, I have something,” Ruto said. “If I had acquired anything illegally with the kind of ‘friends’ I have, I surely would be rotting in jail. Many people believe erroneously that you must be poor merely because your parents were. Some say ridiculously that there are people who were born to be poor. That is the gospel according to the devil,” said the MP. In April, Ruto, Joshua Kulei and others were acquitted of defrauding the Kenya Pipeline Company out of Sh272 million in a land purchase deal. The state claimed that Ruto fraudulently obtained Sh96 million from the KPC in 2001 claiming that he was in a position to sell 1.745 hectares of land belonging to the Ministry of Natural Resources situated in Ngong Forest. Ruto is competing for a presidential ticket with wealthy Finance Minister Uhuru Kenyatta, whose riches were recently estimated by Forbes at $500 million (Sh45 billion). Other possible PNU Alliance opponents include Vice President Kalonzo Musyoka and Saboti MP Eugene Wamalwa who are not considered wealthy. The PNU chairman Prof George Saitoti has said he hopes to stand in 2012 and will seek the alliance’s presidential ticket. Saitoti is thought to be wealthy as is ODM leader Raila Odinga. Yesterday Ruto, a former minister in both the Moi and Kibaki governments, explained that he took several mortgages from Housing Finance Company of Kenya to finance acquisition of his real estate assets. He said his palatial home in Karen and flats in Ongata Rongai were backed by HFCK. He says he has repaid a loan from the Bunge Sacco to acquire a house in Elgon View in Eldoret. His apartments on Jogoo Road in Nairobi cost him about Sh60 million to build in the 1990s, he says. Amaco Insurance has a turnover of hundreds of millions of shillings annually and is one of Ruto’s most successful businesses. Ruto owns an uncompleted hotel near Wilson Airport in Nairobi. He owns Sugoi home and farm in Eldoret. The MP is also said to have invested in the transport industry. Yesterday, the chairman of the Independent Electoral and Boundaries Commission, Isaack Hassan said the commission has now been empowered to monitor campaign funding including investigating the origin of such money. Hassan said the commission may hire its own personnel for the job or outsource it to an independent company. Apart from the Elections Act 2011 and the Political Parties Act 2011, a new Campaign Finance bill is currently being fine tuned by the Constitution Implementation Commission, the Justice ministry and the Attorney General’s office. The bill will cap how much money a politician can spend in an election and block the use of public money from parastatals and elsewhere. Ruto was born at Kamagut village, Uasin Gishu District in December 1966. He went to Eldoret’s Wareng High School for his O levels before proceeding to Kapsabet Boys High School for A levels. He graduated in 1990 with a BSc Botany and Zoology from the University of Nairobi. At university, Ruto was elected the leader of the University Christian Union Choir. He met his mentor President Moi when the choir was occasionally called upon to entertain the Head of State. He was briefly a teacher after leaving college before going into business and politics. In the 1992 election, Ruto joined the campaign team Youth for Kanu 92. He was first elected to Parliament in 1997 on a Kanu ticket. He became Home Affairs minister in August 2002 but lost the post after the December 2002 election when Kanu was defeated by the Narc coalition. He later joined ODM and became a member of Raila’s Pentagon team. Before the December 27, 2007 election, Ruto sought the ODM presidential nomination but lost to Raila. He was appointed Agriculture minister in the coalition government in 2008. In February 2009, Ruto survived a censure motion in Parliament over the maize scam. He was later moved to the Higher Education ministry only to be suspended months later. Ruto has since fallen out with Raila and is now popularising the UDM in the run-up to next year’s general election. “I am determined to run for President because I understand what hustlers go through and can assemble the will to give a real chance to the ordinary Kenyan to be something. This election we will prove that even the children of paupers can be something in Kenya,” said Ruto yesterday. Who’s a Better Player: Berbatov or His Prime minister? Bad start For Kajairo’s New Music Show.